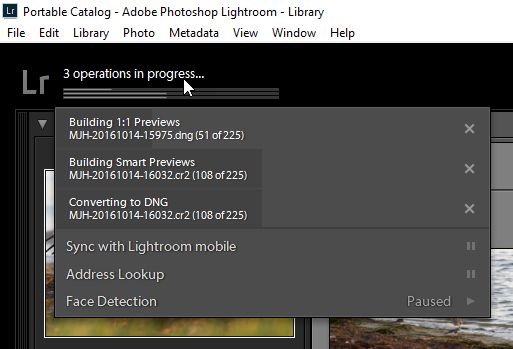 When you start your import process with Lightroom, you may have noticed a progress bar. 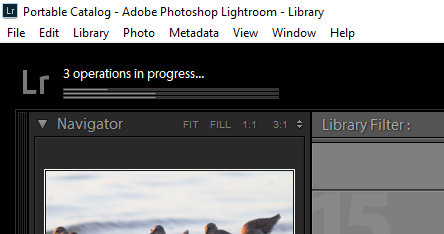 This appears in the upper left part of the window, near the Lightroom logo. 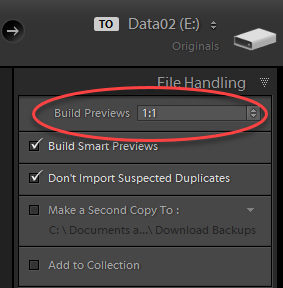 It seems to be tracking the progress of your import, but once the images have all been imported to your computer, one or more new progress bars appear. 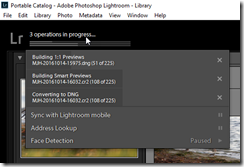 What is Lightroom doing with all those processes? Many people have asked this question. First: Lightroom is building 1:1 previews. We establish this setting in the import dialog box, in the File Handling section. The setting you choose will determine how much time LR spends building previews, Minimal previews are very fast, while 1:1 take a long time. Here, I chose 1:1 because I knew I was going to spend a lot of time browsing and reviewing these photos. I don’t want to have to wait for the “Loading” message that LR shows when it builds previews on demand as you navigate. If you’d like to read more about the difference between the various settings for building previews, see this article over at The Lightroom Queen. Smart Previews facilitate working with your catalog even when your images are offline and unavailable, and I use them as part of my portable Lightroom catalog workflow. Converting proprietary camera raw files to DNG (Digital Negative) takes some time. However, this is a process I’ve embraced. If you’d like to read more about the reasons why I use DNG, you can read more about it here. Better yet, see this excellent explanation– DNG: The Pros, Cons and Myths of the Adobe Raw File Format – at Petapixel. In summary: You may not see all these processes running, depending on your own import settings. But, when you think your import is complete, and Lightroom still seems to be churning away, doing… something, now you’ll know what it is really doing. This entry was posted in Lightroom, Tutorial and tagged Import, Preview.